Homemade pumpkin spice latte! Plus, a fun pumpkin mocha version, too! I’m taking issue with myself for how early I started drinking pumpkin spice lattes this year. It’s never been as early as September. This much I know. My birthday is at the end of this month (OMG THE BIG 3-0! ), so Fall does not start until then for me. But, after a summer of drinking nothing but hot lemon water and green tea, the cold snap last week deemed pumpkin acceptable in my head. I couldn’t predict that the weather would climb back up to 90-degrees, and I’d be left sitting there sipping a hot drink in an Indian summer. But, hey, at least my homemade pumpkin spice latte has real pumpkin in it. And that’s just vitamins, don’t argue me on this, please! So, I copied the method for this pumpkin spice latte that tastes better than Starbucks from The Kitchn. I made a minor adjustment to the pumpkin spice mixture, and I swapped sugar for honey because I don’t need sugar guilt in the morning. I think this homemade pumpkin spice latte is perfect. And I really do think it’s better than Starbucks. Bravo, The Kitchn! Everything you do is amazing, but this drink especially so. 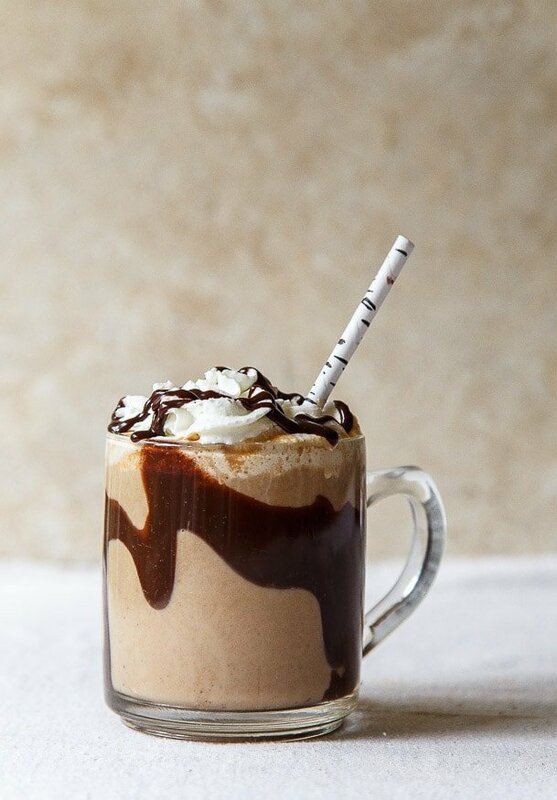 If you want to make a mocha version of this drink, stir in an additional 1 teaspoon of chocolate extract. I use the Nielsen Massey chocolate extract. Then, before serving, drizzle your glass with chocolate sauce. While you’re at it, go ahead and drizzle the whipped cream on top, too. You’ve got nothing to lose. Chocolate also = vitamins and antioxidants! And right now you’re thinking: Two whole tablespoons of vanilla?! Of course that must be a typo. While my recipes are almost always riddled with typos (serious high fives to the reader that always catches them for me! ), this one is not a typo. It’s precisely what makes this latte better than the coffee shop’s. Along with the real pumpkin and honey. Oh, and special spice mixture. Ok, you get it. 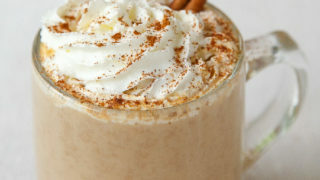 This homemade pumpkin spice latte rocks. Do it! For the pumpkin spice latte version: In a small sauce pan over medium heat, add the spice, pumpkin and honey. Cook while constantly stirring until it starts to simmer, about 45 seconds. Next, stir in the milk and vanilla. Bring to a slight simmer while constantly stirring. Next, use an immersion blender (or transfer the mixture to a blender carefully) and blend until frothy. Divide the espresso between two glasses, and divide the latte mixture on top. Top with whipped cream and serve. For the mocha version: In a small sauce pan over medium heat, add the spice, pumpkin and honey. Cook while constantly stirring until it starts to simmer, about 45 seconds. Next, stir in the milk, vanilla, and chocolate extract. Bring to a slight simmer while constantly stirring. Add chocolate sauce to the two glasses, and add the coffee or espresso. Pour the frothy pumpkin latte mixture on top, and then top with whipped cream. Drizzle extra chocolate sauce on the whipped cream. Combine all ingredients, and store in an air-tight jar. Girrrrrrl, these two recipes are pure gold! Loving this post! Yes! So glad you are featuring this today. Everything about it is better than Starbucks–the real ingredients and the price! Mmmmm….and all that vanilla can only make these better!!! I am really digging your new style of photos. I know you mentioned trying to find your own place a few weeks ago and beginning to include a lot of shots with people in them. And it works. I love it! And I love this. I grabbed a PSL the day they released them at Starbucks and woooooooah. It was so sweet, I couldn’t drink it. Plus, no real pumpkin. So I’ll take your version any day! Glad you share this “early!” I’m always ready for pumpkin! So, I actually read the ingredients in a Starbucks’ PSL. Thank GOODNESS I have this version now. Love being able to enjoy this warm drink in a more wholesome way! Looks amazing and better than the Starbucks variety! We’re having our first chilly day here in Michigan and I feel like I wished this recipe into existence today :) The photos are incredible! Dang girl! I think you covered every possible combo I could ever want! Your photos are totally gorgeous too—love love the light and airy lighting! Pinned. I love this!! SO easy and it looks absolutely perfect. Good luck on the TV show this morning, I am sure you will be amazing! This recipe just made my 53 degree morning…the honey and vanilla together totally rock this dreamy drink – it’s delicious!! I got a pumpkin spice latte Sept ember 1st because I was just so excited it was September, which meant it was basically Fall, which meant it is just about my favorite time of year. The Starbucks version is tasty, but I know pumpkin flavored syrup is no match for the real thing. Can’t wait to try this homemade version! Beautiful pictures as always Christina. Best of luck on your TV appearance this morning! You must share the segment if you can! Welp, you didn’t have to do a lot of talking to convince me – I’m totally making this next week! One of our local coffee shops makes a pumpkin mocha that I can’t resist! Love that I can make my own now! Ahhh! These lattes! And those birchwood straws! Dying. All of this. On repeat. For the next 2.5 months. That’s where I’ll be. I just mixed the spices so I can make this for Ryan and I tomorrow morning! I can’t wait! This looks amazingly good (as usual). Can’t wait to try it. And I love, love, love that it uses real pumpkin. You’ve given me an excuse to buy pumpkin puree, which means I’ll have to make pumpkin bread with the leftovers. Hello, fall! These look awesome! Much better than paying for these at coffee shops. I’m all about this mocha version! Love at first glance. Girl, it’s never too early for pumpkin lattes. Pinned. I want one of these every morning. Love the extra touch of vanilla. I’m making this asap! YUM!!!! I drink iced coffee year round, so I can’t imagine drinking hot water and tea all summer. But I respect a woman with conviction! I love that the recipe calls for so much vanilla. Vanilla is so underrated and yet it makes everything taste soooooo good! What’s not to love about this?? I haven’t had a pumpkin spice latte yet this season, but I’d love to start here! Congrats on your TV appearance! Wish I could see it – you’ll have to post the footage! And these look lovely. I love that your PSL is so quick and easy – I recently posted a refined-sugar-free and vegan PSL but you have to make a syrup! Definitely going to try yours, since my syrup is – gasp – totally finished! oh my gawd, love love love!! and can’t wait to see the Fox2news video!! Love this! Glad there’s some REAL pumpkin in there. Also – watched your little snippet from TV that you posted on facebook. You were great! So calm, cool, and collected. :) Bravo, friend! Okay, so I may be the only person in the world who isn’t ga-ga over the PSL. But adding chocolate? I’m in! Perfect fall drink! Thanks for the pumpkin pie spice recipe: it’s going to be handy this fall! I have to admit, I’m not a fan of PSLs…at least, not the version sold by the big coffee shops. They have a weird aftertaste that turns me right off. However, this at-home version is on the top of my list to try. It looks super delicious and authentic! homemade pumpkin spice lattes > starbucks! 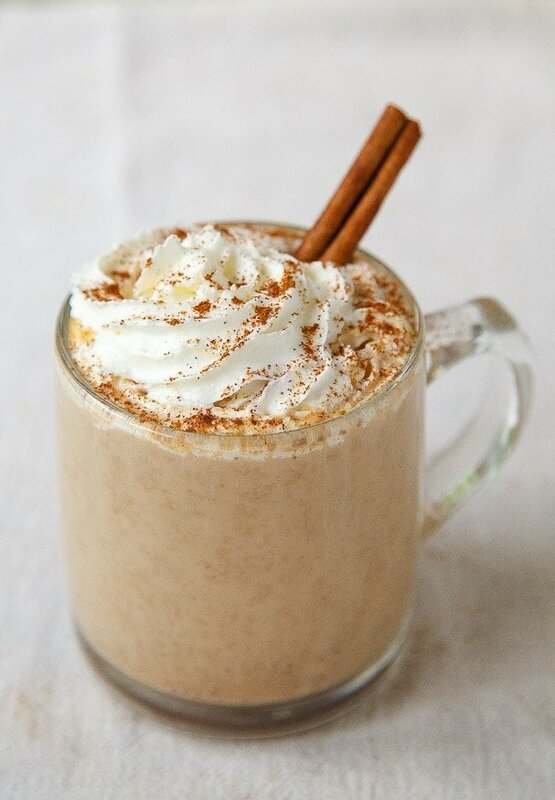 but everyone knows that… the mocha version is calling my name… I need to buy some pumpkin puree; asap! What gorgeous photos! Pumpkin spice lattes don’t appeal to me but that mocha version sure does! It looks so beautiful…I could just stare at it all day. Plus, I know it’s got to be delicious. So late to the party on this one. But YUM!!! Going to have to make this with almond milk and booze. Where can I see the TV clip?? You go gurl! Wow I want that in my face right now!! Chocolate makes anything 10x better! Surprising recipe but must try it. I truly love pumpkin lattes. Thank you. I also truly, madly, deeply love pumpkin milkshakes and frosties if you have a reference for either of those. And pumpkin ice cream. Had one in Omaha of all places and have never forgotten it.